The virus was diagnosed in a horse named Sid, a recent arrival at a yard near Kilsyth. A horse in Scotland has been diagnosed with equine flu. 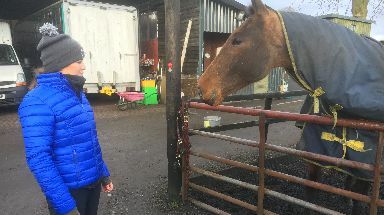 The virus was diagnosed in a horse named Sid, a recent arrival at a yard near Kilsyth, North Lanarkshire. Its owner has voluntarily imposed a temporary closure of the site as a result. Strict disinfecting procedures have been put in place to ensure the virus is kept away from other horses at the yard. The diagnosis comes as racing resumed on Wednesday following a week-long shutdown of the sport following an outbreak at a trainer's stables in Cheshire. New protocols have been introduced to ensure horses have been vaccinated within the last six months, meaning the field at today's races at Musselburgh was reduced as some animals did not comply. So far the outbreaks have been isolated and contained, but many who work in the sport say they remain concerned that more horses will be diagnosed with the flu in coming weeks.